Auckland University of Technology is New Zealand's second largest and fastest-growing university. We offer free enrolment services for the Auckland University of Technology. The Auckland University of Technology is the newest university in New Zealand. It was formed in 2000 when the university was granted status. The Auckland University of Technology has a contemporary feel to it, due to its' unique history. At the same time, the university is renowned for being innovative in all areas of university life. Auckland University of Technology, New Zealand is a hidden gem of the modern world. For all overseas students interested in the exciting, cutting edge world of education and degrees that feed off and into this realm, this university is a superb choice. Why a New Zealand university? What do the worlds fastest racing motorcycle ( the Britten) multiple America's Yacht winners,( Black Magic and subsequent siblings) and the current sci-fi mega movies of Lord of The Rings have in common? They all stem from a culture of daring creativity bar none that is found right here in New Zealand. Auckland University of Technology has in particular a unique field of study -Creative Technologies that specifically is designed around the understanding that today's complex environment must draw from numerous disciplines. This explains why the aforementioned such as the Britten were able to stun the world- the sky is not only not the limit, your abilities, potentials and success in studying here are limited only by your imagination. The AUT Accomodation Services Department is available for advice and support. An option are the AUT Halls of Residence which are very popular with students. 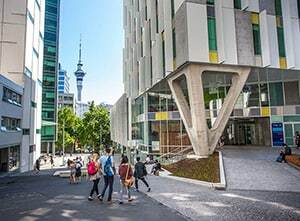 AUT City and North Campus offer student accommodation options. The International Student Support Service Team is dedicated to assisting international students with nearly everything. The ISSS team can provide academic assistance, and are constantly organising social excursions and other events to help you make friends and gain a better understanding of Kiwi culture. The friendly team at the ISSS offices can also process your visa and organise a medical examination, which is required by New Zealand Immigration Services when renewing your visa. Attendance at International Orientation is a compulsory part of your enrolment. The short seminar will introduce you to your support team and offer information on all aspects of your university life. If you are having any academic problems, Te Tari Awhina, Auckland University of Technology’s Learning Development Centre, offers workshops on things like essay writing and referencing. These are just some of the services available to international students. For further details, please contact us by email. A Large numbers of leading local and international researchers and experts have been recruited by the university AUT invests heavily in research and has established new research centres and institutes to further its research profile. Research partnerships and exchanges have also been established with some of the worlds leading universities. The AUT City Campus is in the heart of Auckland. It is AUT’s biggest campus and home to most academic units and the central administration, including the Vice-Chancellor’s office. The City Campus has cafes, restaurants and bars as well as the facilities listed below. The City Campus is a 15 minute walk from Britomart train station and the ferry terminal. AUT shuttle buses stop on campus and public buses stop nearby. The Wellesley Student Apartments are located in the middle of Auckland’s central business district, a 5 minute walk from their city campus. Their fully furnished apartments have four or five bedrooms, two bathrooms and living and kitchen areas. All apartments are phone and internet ready, although it is up to residents to organise connection. The apartment complex also houses a common room which boasts a pool table, table tennis, cable TV and a barbeque area. Furthermore, the Residential Life team organise regular social events in and around the apartments. The AUT North Campus is on Auckland’s North Shore and offers facilities including student accommodation, cafes and the universities biggest sports centre. The centre has a gym, weights rooms, gold swing clinic, indoor courts and a range of cardio and other work out programmes. Membership starts at as little as $1 a day, and can include sessions with a personal trainer. Akoranga Student Village is immediately next door to the North Shore campus. Regular shuttle buses can take students from the village to the City or North Shore campuses. The Student Village offers townhouse style dwellings with five or six bedrooms, two bathrooms and living and kitchen areas. Townhouses are phone and internet ready. The development’s communal facilities include a pool table, cable television and a barbeque area. Limited parking is available and will cost you $170. The Residential Life team also provide social events for residents. Entry requirements depend on your country of origin. In most cases, a pass mark in your countries relevant Secondary School Qualification will suffice, although some in some cases pre-requisites may include a higher mark or a year of previous tertiary education. Some degrees may require you to audition, or to submit a portfolio. Postgraduate applicants require a relevant undergraduate degree. You may also be asked to provide evidence of related work or research experience. Postgraduate applicants whose chosen degree includes presenting a thesis must provide a research proposal. Students who use English as a second language must fulfil the following English proficiency requirements. Scores must have been achieved no more than two years ago. A Test of English as a Foreign Language (TOEFL) score of 550 (with minimum Test of Written English (TWE) score of 4.0) OR computer-based score of 213 (with minimum Test of Written English score of 4.0) OR an internet-based score of 80. A TOEFL score of 575 (with minimum TWE score of 4.5), OR computer-based score of 233 (with minimum TWE score of 4.0), OR internet-based score of 9. Tuition fees are charged depending on the students chosen degree, and differ accordingly. Auckland University of Technology charges an enrolment fee of $150. They also insist that all international students have appropriate travel and medical insurance, and will ask for evidence. All fees are refunded if a student’s visa is denied or if an application for extension is refused. The Auckland University of Technology offers limited scholarships for international students. You can visit the AUT website for more information on the visa status of your home country, or ask an AA Education Network team member. Combining old academic tradition with modern technology and ideas, the Auckland University of Technology is a solid academic choice. It is an especially suitable choice for students beginning their tertiary study, but also has a lot to offer any undergraduate or postgraduate. Auckland is commonly mistaken for New Zealand’s capital city*, as it is the nation’s biggest and most populous city. With a large multicultural population (and the largest Polynesian population in the southern hemisphere), it is also a very cosmopolitan city. Accordingly, the city has a wide selection of things to see, do and eat. The City of Sails (as Auckland is sometimes called, due to the fact that the city boasts two harbours) ranked 4th in a 2009 survey judging the quality of life in 215 major cities around the world, due to its mild climate and fantastic employment and education opportunities. Parts of Auckland lie on extinct volcanoes, making the city a geographically beautiful one, and a haven for thrills seekers. The city is also well loved by sports fans, as it offers a huge range of sporting team and facilities. *In case you were wondering, Wellington is New Zealand’s capital city. Why Auckland University of Technology? The Auckland University of Technology is New Zealand’s newest university, but has existed as Auckland Technical School since 1895. This results in a century old tradition of academic teaching, combined with new, state of the art resources and buildings. Spread across three campuses, AUT offers comprehensive libraries and research offices, a dozen restaurants, bars and cafes and accommodation for over 700 students. They also have a campus newspaper, magazine and radio. AUT is also one of the few New Zealand universities that offers pre-degree studies for students who are not prepared or don’t have the qualifications for degree level study. If you want to enroll in any of these courses, write to us immediately for requirements, course fees, and start dates. AUT University is still inviting students for its Summer School curriculum. To enroll in specific study area and get information on start dates and course fees, write to our student adviser for details. AUT University has announced the Summer School for its program schedule. There would be undergraduate courses in business, faculty of culture and society, design and creative technologies, health and environment, and law. To know details about these summer school programs and various requirements they expect, write to our student adviser. Students who were studying certificate and diploma courses on patisserie cuisine in AUT University have showcased their cuisine skills at the Piko Restaurant recently. During the 3-day show, about 144 dishes were prepared, such as ice creams and many varieties of sweets. The students of hospitality and tourism division also participated in the show. To study cuisine programs taught in the university, write to us. The participants can send in their pieces by February 28. The students must be unpublished writers. Prizes in form of iPads would be given to the winners. The students would get a mentoring time with note writers from New Zealand. Write to us for details if you are interested to take part in this competition. AUT’s Centre for Journalism Media and Democracy (JMAD) has unveiled New Zealand Media Ownership report recently. During the event, issues discussed were about media holdings, asset sales of the media houses, other issues faced by the media in New Zealand. To know details of this report, contact us. On Monday 29th May the New Zealand Tertiary Education Consortium (NZTEC) and the Omani Minister of Higher Education, Dr Rawya Saud Al Busaidi, signed a major educational services contract. Formed earlier this year to bid for the Omani contract, the shareholders in NZTEC are the Academic Colleges Group, Auckland University of Technology, PINZ, University of Otago, Waikato University and Victoria University of Wellington. NZTEC will provide course content, quality assurance and some staff training for four degree programmes to five new Colleges of Applied Sciences being established in Oman. NZTEC is supplying content for degrees in International Business Administration, Information Technology, Design and Communication Studies as well as content for English language courses and academic foundation courses. NZTEC Chair, and Victoria University of Wellington Deputy Vice-Chancellor, Professor Neil Quigley says the Omani contract is the single biggest offshore education project ever undertaken by New Zealand institutions. "New Zealand education institutions have been individually transferring curriculum and providing quality assurance offshore for some time but this significant contract brings that expertise together for the first time. It makes sense for New Zealand education providers to work together because international opportunities like this one are simply too big and too risky for any of them to take on alone." Winning the contract is the culmination of many months of work by the members of the Consortium backed by the Education Sector team from New Zealand Trade and Enterprise (NZTE). The expertise of NZTE was particularly important in negotiating preferred supplier status for NZTEC with the Oman Ministry of Higher Education, bringing the members of NZTEC together to bid collaboratively for the contract, and establishing NZTEC as a limited company. The contract is further evidence of the strength of the relationship between New Zealand and Oman. New Zealand is awarded more fully paid scholarships than its nearest competitor Australia with a total of 86 scholarship students from Oman studying in New Zealand this year. Following the signing of this contract it is likely that NZTEC will enter into further agreements to provide services to the Ministry of Higher Education in Oman. The first students will begin studying the courses provided by NZTEC in Oman in September this year. AUT University's Business School building in Auckland has won one of the New Zealand Institute of Architects' 2006 Supreme Awards for Architecture. Architects Jasmax created the award-winning building to fit the specific, dual-purpose design challenge of academic capability and its central city location. AUT University Vice Chancellor Derek McCormack is delighted the Business School building has been nationally recognised for its design excellence. "AUT University is a dynamic university that strives for distinction in learning, teaching, research and scholarship. An important part of achieving these goals involves providing well-designed, pleasant facilities that meet student and staff needs, now and in the future", he said. The Business School building was one of four designs honoured in this year's Supreme Awards. The Business School houses around 6,000 students in 37 classrooms, two case rooms and seven seminar rooms with over 10,000m² of purpose-built space. Each teaching floor has wireless online access and classrooms are equipped with data shows, document cameras, DVD and VCR players, surround sound, guest laptop capabilities and individual laptops for the students. The fully integrated system is operated from a touch pad control panel fitted to the lecturer's desk. AUT's use of cutting edge technology and classroom teaching supports the university's commitment to innovative learning, says Dean of Business, Professor Des Graydon. "We're providing undergraduates with what the top international schools provide their postgraduates," he said. "Meeting room-style round tables in every classroom shift focus away from the lecturer on to other students and opens the gateway to discussion and debate. Our classrooms have been designed to deliver AUT's student-centred learning and teaching philosophy." Professor Graydon says students sitting facing each other, rather than in lecture theatre rows with 400 other people which mirrors the real world of business. The university's North Shore Akoranga campus library, also designed by Jasmax, won a NZIA 2006 Resene New Zealand Award in the education category at the same ceremony. Couples having fertility treatment may in the near future benefit from a technology developed by biotechnology company KODE Biotech Limited, an AUT University partner institution. KODE Biotech signed an agreement this week with Olso Stock Exchange-listed Danish company MediCult a/s giving them exclusive global rights to KODE Biotech’s Assisted Reproduction Technologies (ART) applications. KODE Biotech works in collaboration with the AUT’s Biotechnology Research Institute. It has an active research team of 14 people and has developed a substantial intellectual property portfolio based on KODE™ technology. This novel technology harmlessly attaches molecules onto cells, ranging from red blood cells to embryos. It has multiple applications in medical therapeutics and diagnostics. KODE Biotech’s Chief Executive Officer Peter Bradley says the partnership between them and Medicult a/s ensures further development and ultimately its conversion into products for ART applications hopefully within four-five years. "We are looking forward to working with MediCult and developing products that will bring meaningful benefits to ART customers,” says Mr Bradley. Although several new techniques in recent years have been implemented to increase pregnancy rates through IVF, the chance for a couple to take home a baby after one IVF treatment is still on average only 25%. “If our early research can be shown to produce favourable outcomes in human clinical trials, this technology will further improve pregnancy and baby-take-home rates and will be applicable within standard IVF and IVM therapies,” says Mr Bradley. KODE Biotech’s work was supported by a Technology for Business Growth grant from TechNZ and a Growth Services Fund grant from NZTE. AUT offers KODE Biotech infrastructural support while the university’s PhD students have the opportunity to apply their academic skills in a commercial environment. Natalie Newman, Victoria McGregor and Ruth Wall (pictured right) were among the dance students put through their paces last month as part of the first intake into the degree’s Royal Academy of Dance (RAD) papers. The prestigious academy and AUT University formed a historic partnership last year, which means Bachelor of Dance students who pass the optional RAD specific papers graduate with the RAD’s “Registered Teacher Status”. Taken by dance lecturer Sue Nicholls, the first paper involves the students carrying out online study followed by one week of intensive dance studio work. The RAD Registered Teacher Status is recognised around the world. A mobile texting platform designed by an AUT University lecturer is delivering course content and study tips into the hands of tertiary students around New Zealand. Sport and Recreation lecturer Peter Mellow originally created the “StudyTXT” system to help his students memorise muscle groups after they rejected the idea of traditional flashcards. Now the system, which is available nationally through both mobile phone networks, is being trialled at AUT, Waiariki Institute of Technology, Waikato Institute of Technology (WINTEC), Otago Polytechnic and Manukau Institute of Technology (MIT). At AUT alone, the messages are being accessed by more than 600 students across 11 papers. The Waiariki Institute of Technology is using the platform for its nursing students to deliver five key messages from two-hour lectures, and it has made the information available to nursing students at MIT and WINTEC. “There is huge potential for education providers to collaborate around course content,” says Peter Mellow. A secondary school trial is also being carried out in a range of NCEA subjects with the goal of offering the service to all secondary schools in New Zealand by July 2006. As well as text messages, StudyTXT hosts MPG4 and WMV movie clips which can be downloaded for free to play on the iPod video, PSP and video capable cellphones. MP3 audio files (podcasting) of lectures are also provided for free so students can listen to their course content on their MP3 player or MP3 capable cellphone. Peter Mellow recently presented at a conference in Australia and gathered enough interest there to explore a potential export market. We are very pleased to announce that AUT International House is now a TOEIC testing centre and offers TOEIC examination preparation courses. Students of mid intermediate level and above who are enrolled in full-time General English courses can take a TOEIC examination preparation course for a period of one to two months as an afternoon option instead of General English. General course materials are included in the fees, but students will need to buy a specialised TOEIC examination course book for this option. A Auckland University of Technology student, Jenny Jeffries, has won the right to have her work published on more than 750,000 phone directories across the whole of Auckland. Ms Jeffries was instrumental in designing the cover of this year's Auckland White Pages edition. Ms Jeffries is pursuing a one-year graduate diploma in computer publishing and has also won $3500 in prize money and the 2006 Auckland White Pages Art Award in addition to her cover design being featured on this year's Auckland White Pages. “I was inspired by the sheer vitality and exuberance of the region, said Jenny. “I love the rolling hills, the volcanoes, and the way the seas almost touch. Everything sparkles on a sunny day, and the landscape is full of colour and a variety of shapes." All artworks from the awards are presented as gifts to the telephone counselling service What's Up and then sold for charity purposes. The AUT's Institute of Public Policy (IPP), a prominent think tank, have joined forces to form the Metro Project Group. The IPP has partnered with the Auckland regional council and the Committee for Auckland to develop an action plan for shaping the future development of the Auckland region. It's all part of a push to increase productivity across the whole Auckland region. Institute of Public Policy deputy director David Wilson, the only New Zealander in the team, described the plan as one with a regional focus rather than a city centric focus. “This review is not just about Auckland City, it’s looking at the whole region – North Shore, Waitakere, Manukau, Rodney, Franklin and Papakura," said Mr. Wilson. The team will launch the project with working papers after thorough consultation with all relevant stakeholders and then present the findings at a symposium in early April. Besides the Metro project, the Institute is also focussing on other development projects. A new one-year professional Master of Design programme being launched in July will bring the number of postgraduate programmes on offer at AUT University’s School of Art and Design to five. AUT has the largest postgraduate area of any New Zealand-based Art and Design school. “This area has grown from 12 students and the equivalent of 2.5 full-time staff in 1997 to a projected 120 students and 14 full-time staff by the middle of this year,” says Associate Professor Frances Joseph, inaugural postgraduate programme leader. This year there are 110 students enrolled across the four existing postgraduate programmes – the Bachelor of Art and Design Honours programme, Master of Arts (Art and Design), the MPhil and PhD. The new Master of Design and a Doctor of Design being introduced next year will focus on the professional design sector and will be delivered using a model similar to an MBA with intensive weekend workshops, specialist industry and international lecturers and online support. Since 1999 more than 120 students have successfully graduated from the postgraduate studies area which includes specialist areas of graphic, spatial and fashion design and visual arts as well as art & design theory, strategic design, new media and interdisciplinary practices. Another move underpinning recent growth is the introduction of the online Art & Design Postgraduate Network (ADPGN), which allows the MA programme to be delivered off campus with the support of regional polytechnics. The off campus delivery of the MA programme began in 2004 with a group of six students based in Wanganui. It has grown to 31 students and is now supported in Nelson, Bay of Plenty, Hawkes Bay and Northland. The ADPGN system was developed by Dale Fitchett, John Eyles, William Lu and Frances Joseph, and now supports all art and design postgraduate staff and students with access to a communication system, curriculum, course delivery and resource material, forums and special interest groups. Associate Professor Joseph, who steps down as postgraduate programme leader this year, says ADPGN complements more traditional face-to-face teaching and learning methods such as tutorials, lectures and seminars. Associate Professor Tina Engels-Schwarzpaul will take over as programme leader. An AUT PhD student has discovered a small population of green sea turtles in New Zealand waters. A turtle being tracked as part of PhD student Dan Godoy’s research has made a 500km journey to return to where he spent the better part of a year being rehabilitated. Dan believes the time spent recuperating at Kelly Tarlton’s Underwater World left an imprint on the green sea turtle’s brain which saw him travel from where he was released in the Far North’s Parengarenga Harbour back to Auckland’s Waitemata Harbour. The AUT University student is devoting his research to the migration, habitat-use and population genetics of green sea turtles in New Zealand and had attached a $3500 satellite tag to “Reeves” the turtle before releasing him in March. During a visit to Rangaunu Harbour (south of Parengarenga) about the same time, Dan was excited to find more green sea turtles. “Previously it was assumed that our winter water temperatures were too cold to sustain a resident population of sea turtles, year round. This means, there may be a small population of green sea turtles established here that we have never known about,” says Dan. Dan is working with AUT’s Earth and Oceanic Sciences Research Institute (EOS). Established in 2002 the institute focuses on terrestrial and aquatic environment research in and around Auckland. The government has decided to step in and prevent universities and colleges from cramming in students into tiny lecture halls by offering them incentives to improve the quality of their course delivery. The government has decided to that it is time for a real shakeup of the tertiary sector so that it is more productive and quality oriented. The Cullen Plan as proposed by its' architect, the Tertiary Education Minister Michael Cullen, seeks to examine the future directions for tertiary sector funding. Cullen said that the aim was to create a system which produced quality graduate outcomes. "Funding will no longer solely driven by what students decide to enrol in. Rather we are moving towards a system driven more by outcomes we need so that the government can achieve its' social and economic policies", he said. This attempt at tertiary funding reform is perceived by many as a push towards imposing quality contol mechanisms on tertiary education providers and a move away from funding low quality courses which deliver little positive outcomes. The move is towards areas which satisfy New Zealand's needs as part of the government's strategic policy. At present, tertiary institutions receive funding based on student enrolment numbers but the vast reality is that the majority of students do not complete or fail their courses. As such, the government wants to move away from this policy to which rewards performance.